Runtime: 2 hr. 2 mins. Alita's background might be considered "standard dystopian." It takes place in the 26th century, 300 years after "The Fall" (a war with Mars that devastated Earth). A cybersurgeon, Dr. Dyson Ido (Christoph Waltz), finds the remains of a cybernetic warrior (with the human brain still intact and functioning) in a junk yard. 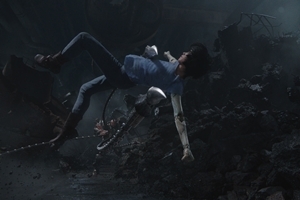 He brings the "core" back to his workshop and installs her into a body he had developed for his murdered teenage daughter and gives her a name: Alita (Rosa Salazar). Alita awakens with complete amnesia and, over the span of several days, becomes familiar with her new body and the feelings that come with it. She is instantly infatuated with one of Dr. Ido's young associates, Hugo (Keean Johnson), but others in the doctor's circle aren't as friendly - notably Ido's ex, Chiren (Jennifer Connelly). One night, Alita follows her "father" when he goes out. On this excursion, she learns a secret about him but discovers more about herself and even recovers a lost memory. When placed in a dangerous situation, her subconscious instincts take over and she becomes a deadly fighting machine, defeating experienced assassins using combat techniques from a "lost age." Alita's prowess attracts the attention of Vector (Mahershala Ali), the criminal mogul who runs the local gladiatorial contest of Motorball, and Nova (Edward Norton in an uncredited cameo), the godlike ruler of the last great sky-city, Zalem. Without preamble, both Vector and Nova decide that Alita represents a danger to their respective empires and dispatch minions to kill her and/or her beloved Hugo. Alita's look and voice are supplied by a motion-captured Rosa Salazar (her familiarity with these kinds of films hearkens back to the Maze Runner movies, where she played Brenda). She's a relatable and appealing character and, when circumstances force her to shed her adopted identity of a fragile, naïve girl, it's hard to resist applauding. Her appearance - almost human yet obviously synthetic with wide manga-inspired eyes - may provoke disparate reactions. It worked for me but some may find there to be something creepy or unsettling about her. None of the film's human characters match Alita for audience identification nor are there any acting surprises to be found here. The various Oscar-winners - Jennifer Connelly, Christoph Waltz, Mahershala Ali - do what's expected of them in a production more interested in technical accomplishments than great performances. As sci-fi action/adventure films go, Alita is suitably thrilling. Rodriguez's strengths - a strong visual sense and the ability to work in a CGI-heavy environment - are in evidence. Alita looks good (even if the "preferred" 3D is superfluous), although its future interpretation of a deteriorated Earth isn't especially unique now that we've seen countless YA films with a similar vision. James Cameron's screenplay isn't a masterpiece of unique ideas - in fact, it seems oddly like a PG-13 version of the hard-R rated Netflix series, Altered Carbon - but Cameron's talent has always been recycling existing stories and tropes and making something compulsively watchable out of the result (not unlike George Lucas and Steven Spielberg). One could argue that there's a little too much going on for a two-hour movie overstuffed with subplots that never achieve escape velocity. The whole "Motorball" element, for example, feels strangely underdeveloped - we keep expecting it to be more important than it ultimately is. Nevertheless, Rodriquez nails the pacing - it's slow enough to allow for character development (at least where Alita is concerned) but ramps up during the well-choreographed battle and chase sequences. Everything moves along fine...at least until the final few minutes when it becomes apparent that we're about to be victimized by a story that requires multiple installments to play out. Although Alita finds a convenient stopping point to run the end credits, it's more of a pause than a true conclusion, leaving the viewer frustratingly unfulfilled. Without a follow-up, the character's story will be left incomplete - another example of filmmakers whose hubris about the inevitability of sequels will likely leave fans high and dry. Put this one on the shelf alongside The Golden Compass and Divergent.